Recording is an essential task in human services. It helps to focus the work of practitioners and supports effective partnership and planning with people who use services. 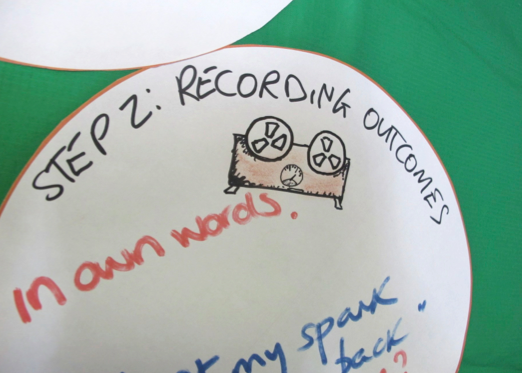 When adopting an outcomes approach, recording provides an analytical tool and a way of clarifying purpose. One of the products of the Meaningful and Measurable project which finished early in 2015 was a collection of examples of recorded outcomes from different sectors. These are not intended to represent perfect examples, but are a prompt for discussion and learning. Recording supports continuity when there is a change of staff and allows for information to be exchanged between relevant organisations. Recording is also necessary for planning, monitoring and reviewing progress, at individual, service, organisational and locality levels. Achieving good quality recording is also necessary if the information is to be used for decision making. An earlier guide on recording outcomes from 2011 illustrates some common errors in recording outcomes.